Very little is known about Lizzie Burns, the poor Irishwoman who married the co-author of The Communist Manifesto and the ﬁrst and greatest of the champagne communists, Friedrich Engels. In this novel, Lizzie Burns is ﬁnally given a voice — one that won’t easily be forgotten. 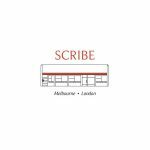 From the bathing huts of Ramsgate to the hovels of Soho, from a surreptitious life in Manchester to a notorious one on the handsome new parade that is London’s Regents Park Road, we follow Lizzie and the Engels household as it struggles to match its communist principles with its hunger for the high life. 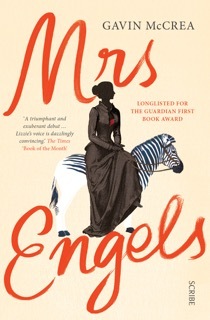 At the heart of all the revolutionary tumult stands the woman who will one day become Mrs Engels, as compelling and charismatic a ﬁgure as ever walked the streets of Victorian England, or its novels. In giving her new life, Gavin McCrea earns his place in the pantheon of great debutant novelists. Gavin McCrea was born in Dublin in 1978 and has since travelled widely, living in Italy and Spain, among other places. 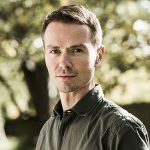 He holds a BA and an MA from University College Dublin, and an MA and a PhD in creative writing from the University of East Anglia (where he was one of the few students awarded a scholarship).